a deity that I also pray to each spring...in gratitude and anxiety...over another new season in the garden. So today, I am petitioning this God to be a beneficent one in the gardening season of 2013. 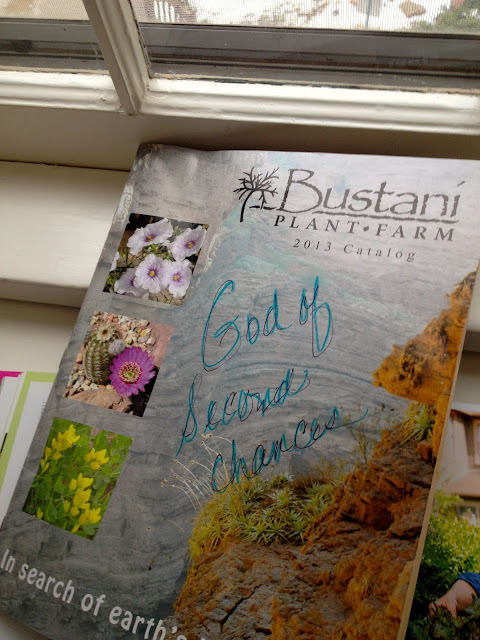 Just in case there is a little static in the connection, I'm not leaving anything to chance (doing what is within MY power) and ordering some tough as nails specimens from BUSTANI PLANT FARM (get a catalog here). To quote them: " We are always looking for the best performing plants for Oklahoma and the surrounding region and often travel to countries with similar climates." So my strategy for this year: identify plants and flowers I can't live without in my English garden (or at least the look I can't live without...) and find tough doppelgängers that will provide the same effect, but can handle our rough and tumble summers. The beautiful silver foliage above is from G. Rudebeckia maxima (Giant Coneflower), a perennial I bought from them a couple of years back. Ohhhh, the irony, the irony.